Reza Abdoh, avant-garde director, playwright, company leader and poet, was born on February 23, 1963 to Ali Abdoh and Homa Oboodi in Teheran, Iran. At the age of seven, he saw Peter Brook’s production of A Midsummer Night’s Dream in London and was deeply affected by it. Although there is some dispute regarding the biographical facts of his life from 1972-1982, it is known that during this period, he lived in England, where he directed Peer Gynt by Henrik Ibsen around 1977. About 1980, he moved to Los Angeles where he directed numerous plays, including a program called Three Plays by Howard Brenton (1983), Shakespeare’s King Lear (1985), The Farmyard by Franz Xavier Kroetz (1985), The Sound of a Voice and As the Crow Flies by David Henry Hwang (1985). In addition to directing, by 1986 he began to create his own works such as A Medea: Requiem for a Boy with a White Toy and Rusty Sat on a Hill One Dawn and Watched the Moon Go Down, both produced in Los Angeles. It was also at this time he created the first in a body of videos: My Face and Oh Thello Sit Still. Abdoh’s theatrical works often included multimedia elements; his works did not rely solely upon the text to convey their meaning. Reza Abdoh adapted and directed King Oedipus by Sophocles and Eva Peron by Copí at Theatre Upstairs (Los Angeles, 1987). In 1988, he directed Peep Show, a work which he co-authored with Mira-Lani Oglesby. Produced at Los Angeles’s Hollywood Highland Hotel, Peep Show won L.A. Weekly’s Production of the Year Award. Continuing his collaboration with Mira-Lani Oglesby, he directed Minamata (1989) at the Los Angeles Theatre Center. 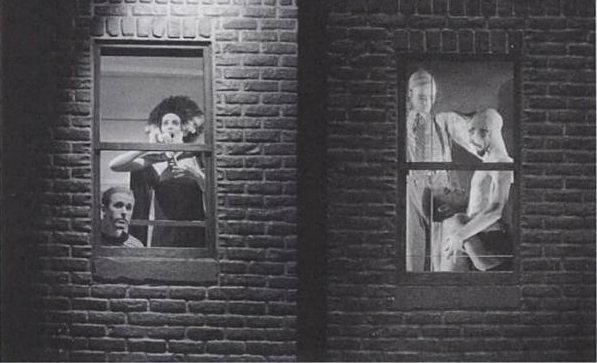 In 1990, Father Was a Peculiar Man, directed by Abdoh and produced by En Garde Arts, was performed in New York City’s meat-packing district. That same year saw his creation and direction of The Hip-Hop Waltz of Eurydice at the Los Angeles Theatre Center. This work would also be performed at the Festival de Theatre des Ameriques, Montreal (1991), the Sigma Festival, Bordeaux and Mercat des la Flors, Barcelona (1992), and at the Festival d’Automne, Paris (1993). He also directed Pasos en la Obscuridad, a work he co-created with Frank Ambriz, at the Los Angeles Festival in 1990. 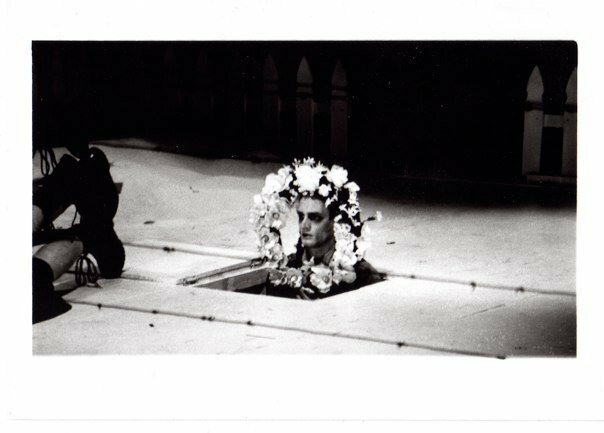 In 1992, Dar A Luz performed his work The Law of Remains in the Diplomat Hotel, New York City and in October of that year took the production to the Walker Arts Center’s Freight House in Minneapolis. 1992 saw him branch out to other media—he created and directed The Blind Owl, a ninety-minute feature film; he also directed Long Beach Opera’s production of Verdi’s Simon Boccanegra. His Tight Right White was performed by Dar A Luz in New York City in 1993. From May through July of that same year, he toured with Dar A Luz, which performed The Law of Remains in the Springdance Festival, Utrecht; Festival Internacional, Granada; Wiener Festwochen, Vienna; Internationales Tanzfestival, Munich; Theater am Turm, Frankfurt; Sommertheater, Hamburg, and the Festival d’Automne, Paris. He directed Quotations from a Ruined City, which he wrote with his brother, Salar; it was performed by Dar A Luz in New York City in 1994. In 1995, he wrote A Story of Infamy (a.k.a. The History of Infamy). It was never produced. Reza was placed on life support on the first day of rehearsal and the production was abandoned. Reza was later discharged from the hospital and died at home about a month later. He was among the first five winners of the Cal Arts/Alpert Award in the Arts. Reza Abdoh died of complications from AIDS on May 11, 1995 in New York City at the age of 32. In 1996, he was posthumously awarded a “Bessie” Choreographer and Creator Award for Sustained Achievement.